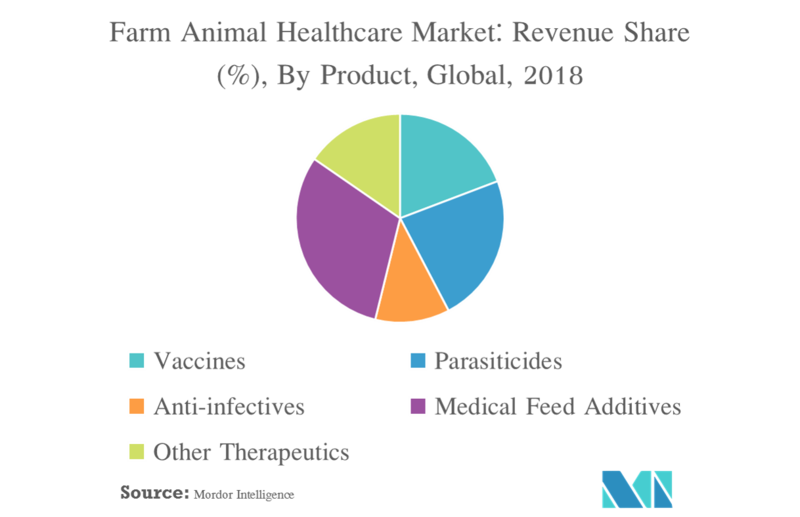 The market is segmented by product (vaccines, parasiticides, anti-infectives, medicinal feed additives, and other therapeutics), animal type and geography. 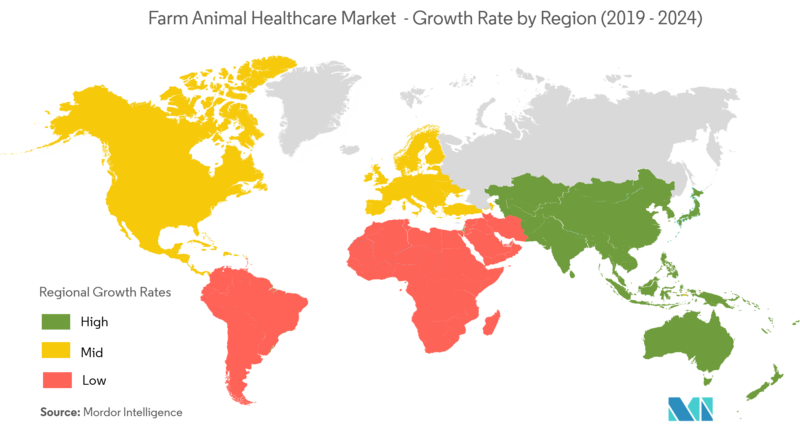 The global farm healthcare accounts a significant share in the entire veterinary healthcare market. There are high efforts made by government initiatives particularly to modernize agriculture through technology and continued scale consolidation. After the 2007/2008 Melamine Crisis, the large farm scale was promoted heavily across multiple countries globally, in the past one decade. With that, stricter food safety/quality improvements and environmental regulations have formed which are useful as well as easily adopted in many developing countries. Certain initiatives such as zero environmental impact of agricultural residues, over the five years, by the Chinese government and several environmental protection laws have helped to focus on stating new strategies for the development of better healthcare of farm animals. In addition, there are several efforts to educate the farmers and collaborate with domestic firms to develop better channels for distribution of healthcare products for farm animals, and connect with ecological and social values, thus driving the demand of farm animal healthcare market. The scope of the report emphasizes the importance of farm animal care, for which the veterinarian is the pivotal link for the companies for the continual improvements in farm animal health and welfare. 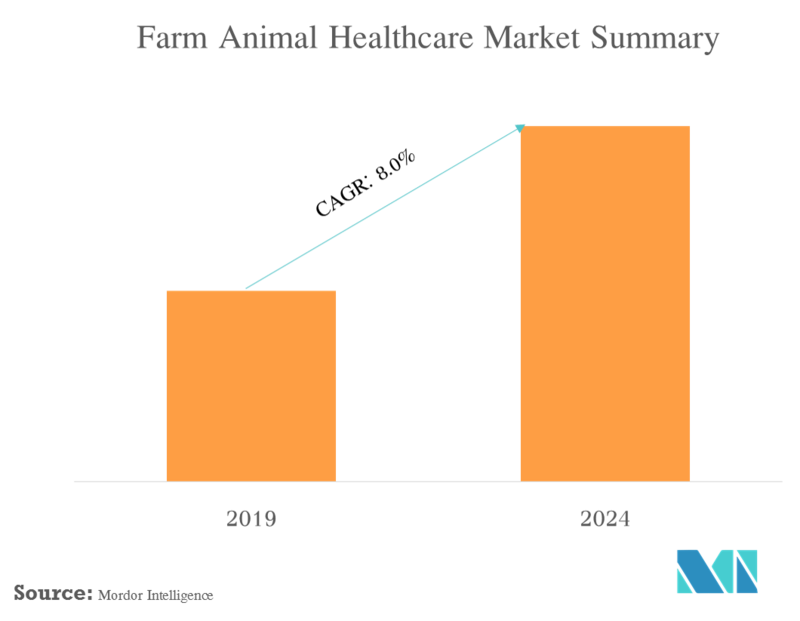 The report segments the farm animal healthcare market by product, which consists of therapeutics such as vaccines, parasiticides, anti-infectives, medicinal feed additives, and other pharmaceuticals. By animals, the market segmentation includes cattle, swine, poultry, fish, sheep, others. By geography, the market captures the scenario of major countries, globally. Vaccination is an essential factor to protect the farm animals from disease and possibly deaths, in several cases, globally. There is a wide range of diseases for which vaccinations have been developed and well established for farm animals. Every country has developed certain guidelines for vaccination which are followed at the national level to protect the farm animals from diseases and keep them healthy such as Responsible use of Medicine in Agriculture Alliance (RUMA) in the UK have released guidelines of vaccines in farm animal production. In the US, the veterinary biologics are regulated by the USDA Center for Veterinary Biologics, part of the USDA Animal and Plant Health Inspection Service. With that, several companies establishing on improving the distribution channels with innovative therapies are driving this market. Few recent technological advancements and innovations in the process include oral vaccine development by Lumen Bioscience, supported by the grant from the US Department of Agriculture and edible vaccine system in development by Irish Biotech company, MicroSynbiotiX Ltd.
North America region is among the major contributor to agriculture, livestock, technological advancements and implementation of farm animal healthcare benefits across the region. In the US, agriculture is an important factor for the country's overall economy. The innovation level of companies and government awareness along with preparedness level for farm animal healthcare are fast compared to other regions. Recently, by the end of 2018, the 2018 Farm Bill reported the preparedness level of the country as well as collaboration between animal health industry and the government to bring all feed and water uses of medically important antibiotics under the supervision of a veterinarian and eliminate their use for growth promotion. With that, to fight against some of the foreign animal disease threats, there was the establishment of foot-and-mouth disease vaccine bank and increased funding for surveillance and diagnostic support through the National Animal Health Laboratory Network. As per the Animal Health Institute, 2018 report, the expenditure has grown significantly to manage more than 9 billion food-producing animals in large and small farms across the country. With that, the United States is among the major exporter of food supplies to Canada and Mexico. 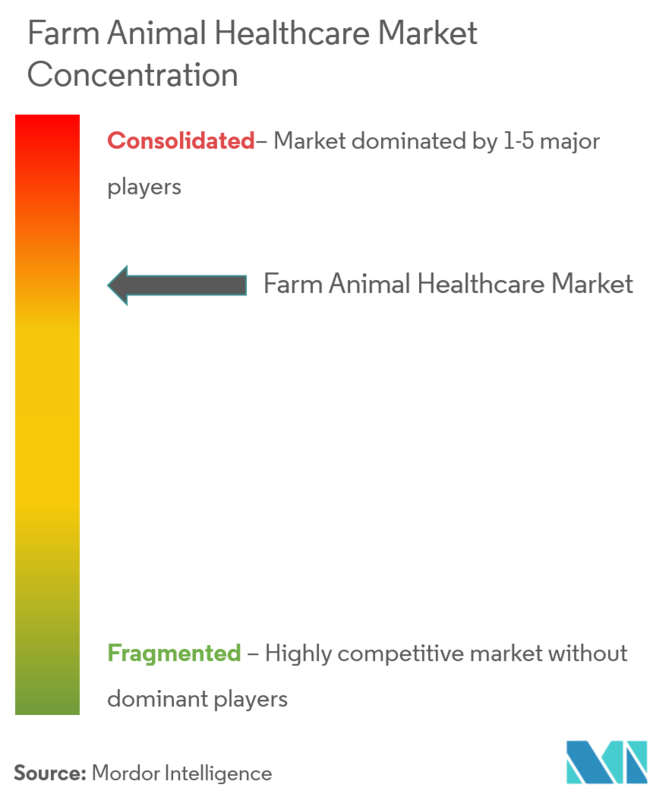 Thus, North America is one of the primary regions for the farm animal healthcare market. With large requirements of food supplies and demand for social welfare between human and animals, the companies are highly competitive to invest in the healthcare of farm animals. The market observed major companies merger and acquisition in recent years to enhance their technology and global dominance. 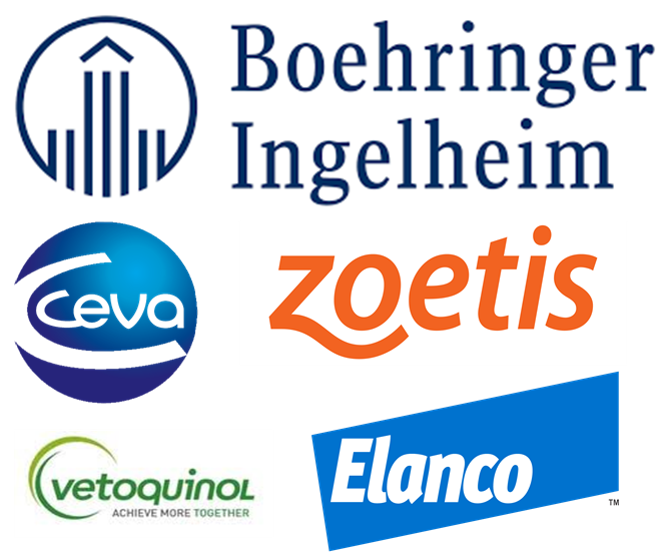 Some of the major players include Zoetis, Merck, Boehringer Ingelheim, among others. 6.1.6 Merck & Co. Inc.